Following the unveiling of the new Ram, Chevrolet Silverado, and GMC Sierra heavy-duty trucks, Ford has wasted no time lifting the wraps off the new and improved 2020 F-Series Super Duty, which arrives with a new engine option, refreshed styling, and new tech. It uses an all-new cam-in-block, overhead valve architecture with cast iron block and forged steel crankshaft for maximum durability. Port injection with variable-valve timing optimizes the intake and exhaust to match performance with workloads, and oil jets cool the pistons under heavy loads. Both the new 7.3-liter V8 and upgraded 6.7-liter diesel V8 are paired with an all-new 10-speed heavy-duty TorqShift automatic transmission, which features a wider gear ratio span than the previous 6-speed auto “designed for the harshest towing conditions.” According to Ford, the compact transmission fits in the same space as the six-speed despite having four extra gears and weighing only 3.5 pounds more. Five drive modes are available: normal, tow/haul, eco, slippery, and deep sand and snow. Also new for the 2020 model is an updated version of Ford’s Pro Trailer Backup Assist designed to make “negotiating even the largest trailers into the tightest of spaces easier than ever before”. It is used in combination with the truck’s Trailer Reverse Guidance system, which shows the trailer angle and direction and provides steering suggestions to most efficiently direct a trailer backward. Both systems are built to accommodate all trailer styles, including fifth-wheel and gooseneck trailers. Other driver aids include pre-collision braking with pedestrian detection, blind-spot monitoring with trailer coverage, lane-keep assist, and automatic high beams, which all come standard on the XLT trim level and higher. 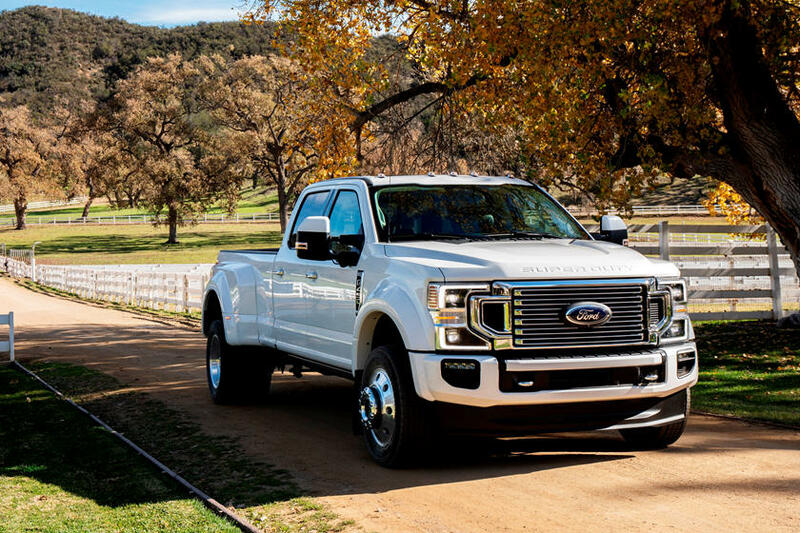 Inside, the 2020 Super Duty comes with a 4G LTE Wi-Fi hotspot as standard that can connect up to 10 devices at a time and supports FordPass Connect telematics functions. USB Type C charging ports and wireless phone charging have also been added. On the outside, the front-end has been enhanced to optimize cooling and lighting performance under heavy loads. All dual-rear-wheel Super Duty trucks are fitted with a uniquely designed high-airflow grille optimized for maximum powertrain cooling. The LED headlights have also been redesigned and offer improved performance, while high series trucks feature continuous signature lighting. Other exterior changes include an improved front bumper and air dam, a refreshed tailgate design, revised taillights, and a restyled rear bumper. New materials are also available for the cabin. The Limited trim’s interior has been refreshed with Ebony and Highland Tan colors and features authentic materials such as genuine leather, a coarse ash wood in black and modern brushed aluminum trim. Crafted details include decorative stitching on the leather-wrapped instrument panel topper, wrapped door armrests, seating and center console lid, and an embroidered Super Duty logo added to the floor mats. The new 2020 Ford F-Series Super Duty arrives in dealers this fall, but pricing details are being kept under wraps for now.